A new hope for pangolins? This is a guest post by Sarah Heinrich. Pangolins, or scaly anteaters, are the most heavily trafficked wild mammal in the world, with over one million illegally traded individuals in the last decade alone. Eight species of this shy mammal exist: four in Asia and four in Africa. Almost every part of their body is used for different traditional, culinary, and decorative purposes. Pangolin scales are believed to have healing properties in traditional medicines, their meat is a delicacy in restaurants and their consumption is considered a symbol of status, and their leather has been highly sought after, particularly for American cowboy boots. Increasing affluence (particularly in Asia and Africa) has resulted in more people being able to afford pangolin products, and the animal has been driven to the edge of extinction in various parts of its global range. Two of the Asian species, the Sunda and the Chinese pangolin, are listed as Critically Endangered by the IUCN Redlist of threatened species, while the remaining two Asian species, the Philippine and the Indian pangolin, are listed as Endangered. All four African species are listed as Vulnerable, but they are increasingly threatened and increasing numbers of African pangolins have been observed being trafficked from Africa to Asia in recent years to supply the Asian market. All eight pangolin species were previously listed in Appendix II in CITES and a zero export quota for all four wild caught Asian species traded for primarily commercial purposes had been established in 2000. A new decision was agreed upon at the CoP17, and in the future all eight pangolin species will be listed in Appendix I, offering them far greater and much needed protection. Almost all international trade will thus be prohibited. In a recent contribution on pangolin trade, we analysed CITES trade of all eight pangolin species from 1977 – 2014. The CITES trade database provides the most complete dataset for trade in wildlife species around the globe. 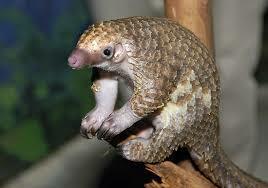 In ‘Where did all the pangolins go? International CITES trade in pangolin species’ we found that CITES trade in Asian pangolin species decreased through time, whilst trade in African species increased post-2000, after the establishment of the zero export quota. Despite this quota for all wild sourced Asian species, they were still continued to be traded after the year 2000. The results confirm a worrying trend that had formerly only been observed in illegal trafficking: African pangolins in trade increasingly replace the trade of the dwindling Asian pangolin populations, and African pangolins are being traded in increasing numbers. Furthermore, we investigated the underlying trade networks and identified an increasingly complex international network through time, with the United States of America (US) being the dominant player in the global pangolin trade that was reported to CITES. The US was the most frequent trade country throughout the entire period and was the greatest importer of pangolins, and their products: measured both in volume as well as frequency. While it is believed that demand is predominantly originating from Asian countries, within the pangolin ranges, we could show that demand is also coming from non-range countries, especially the US, but also Japan and certain European countries. These new insights highlight the need for further research into pangolin trade, especially into demand arising from both range- and non-range countries. The latest decision to list pangolins in Appendix I is crucial for their conservation, and provides them with a new hope for the future. Unfortunately this will not stop the illegal trade in pangolins, which is still threatening their survival. Further investigations into the trafficking of pangolins are now desperately needed, especially in regards to frequently used trade routes and re-distribution network hotspots, to assist law enforcement in directing their efforts more effectively. The fight to save the pangolin therefore continues. The world’s largest wildlife trade meeting in history took place in Johannesburg, South Africa from September 24th to October 5th, 2016. Representatives from over 180 countries participated in the CITES (Convention on International Trade in Endangered Species of Wild Fauna and Flora) 17th Conference of Parties (CoP17). CITES regulates the legal trade in over 35,000 species of animals and plants, which are listed in one of three Appendices. Every three years all member countries (‘Parties’) meet to discuss, review and amend international regulations for the trade in CITES listed species. In this year’s meeting, the listings of close to 500 species were reviewed, and one of the notable beneficiaries was the fairly unknown pangolin. What’s scaly, super cute and illegally traded for traditional medicine? This entry was posted in Conservation Science and Technology and tagged CITES, pangolin, Sarah Heinrich. Bookmark the permalink.